Images are very useful if there is a risk of total data loss due to hardware malfunction. If bad blocks are constantly appearing on a hard drive, you must immediately create an image of this drive. All data search, scan and restoring can be done from this image. While creating images, R‑Studio can simultaneously perform disk scan and save scan information to lessen time necessary to process the disk. The image can be saved on the remote computer if it is created via network . 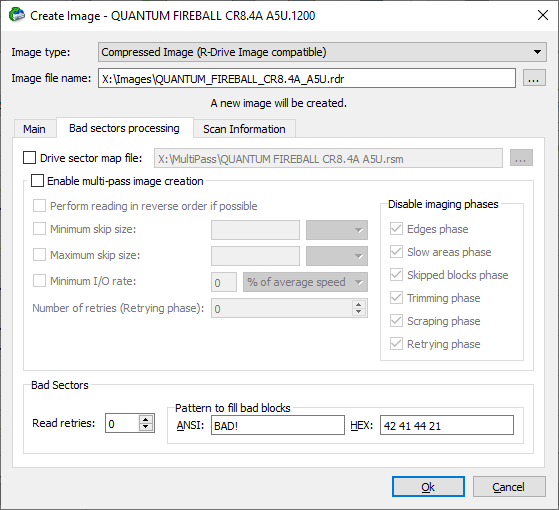 R‑Studio can also load and process images created with the DeepSpar Disk Imager™ . If this option is selected, R‑Studio will create a simple exact copy of the object. This image format is compatible with the previous versions of R‑Studio . If this option is selected, R‑Studio will create an image file which can be compressed, split into several parts, and password-protected. This image file is fully compatible with the images created by R-Drive Image , but incompatible with the previous versions of R‑Studio . You may set this option to Automatic and let Windows decide how to split the image file. This mostly depends on the file system on the destination disk. You may also either explicitly specify the split size, or choose a preset for various devices with removable storage. Select Fixed size for that. 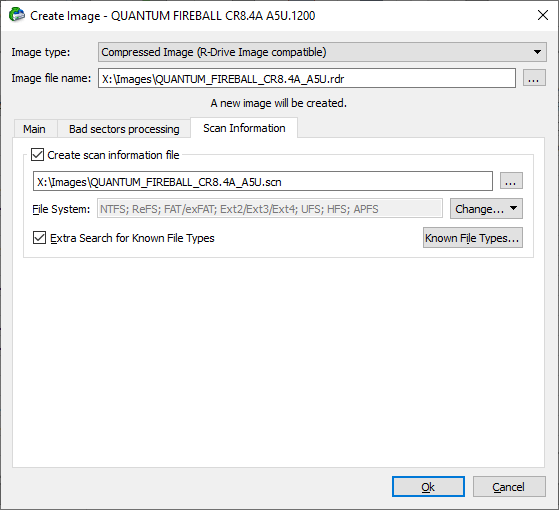 Active only if the Compressed image (R-Drive Image compatible) is selected. 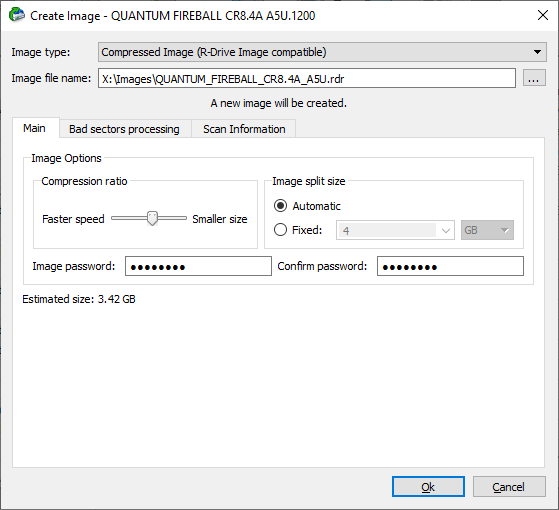 If this option is selected, R‑Studio will perform disk scan simultaneously with image creation. See the Disk Scan help page to learn scan options. Specifies a value for I/O Tries , or how many times R‑Studio will try to read a bad sector. Specifies a pattern R‑Studio will use to fill bad sectors in this image. You may specify the pattern either in the ANSI or Hex data format. Note: R‑Studio will never ever try to write anything on the disk from which data is to recover or an image is to create. This pattern fills bad sectors only in the image. If a remote computer is connected for Data Recovery over Network , the Create Image dialog box will have a different look. You may save the image to the local or remote computer. > R‑Studio will start creating the image, the Progress message showing the progress. If a remote computer is connected for Data Recovery over Network , the Open Image File dialog box will appear when you select a place to load the image file from. You may load it from the local or remote computer. Depending whether this is a byte-by-byte or compressed ( R-Drive Image compatible), its appearance in the Drives panels is different. You may perform all data search, scan, and recovery from this image as it were a regular drive/​disk object. A logical disk (or disks) containing in an image can be connected to the operating system as a device which makes its content accessible to any program including any other data recovery software.